Clara is desperate to get away—from the memories that haunt her in Wyoming and the visions of a future she isn’t ready to face—and spending the summer in Italy with her best friend, Angela, should be the perfect escape. . . .
For as long as she can remember, Angela has been told that love is dangerous, that she must always guard her heart. But when she met Phen two years ago she was determined to be with him, no matter the costs. Now she must decide whether she can trust Clara with her secret, or if telling her the truth will risk everything she cares about. Alternating between Angela and Clara’s perspectives, Radiant chronicles the unforgettable summer that will test the bounds of their friendship and change their lives forever. It’s the summer before Clara and Angela goes to Stanford, and they spend it in Italy. What a summer vacation, right? But Clara was desperate to get away from everything that has happened to her and her family just recently, and Angela just wanted to discover more of their angel stuff…or so Clara thought. 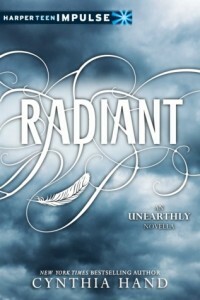 I thought I didn’t have to read Radiant before I get to read Boundless, but I’m glad I had some sense to get this because I wouldn’t have understood the final book in the Unearthly series if I didn’t. Radiant alternates from Angela to Clara, and for the first time since Unearthly, we get to see Angela’s side in things. Is she evil? Is there something about her that will harm Clara and make us hate her? This novella sort of answers that, and we see Angela’s side — the little of it anyway. It makes you wonder if this book will mean something in the end, if the events here would lead to something. Series finales are a tricky thing, I think. A finale can make or break a series, especially in the paranormal romance genre, and ones with love triangles. Not that I know a lot, except for those that I’ve already read, but there were several finales that just sucked that I wished I never read them because it ruined the entire series for me. However, I had faith in Cynthia Hand, that she would end the only angel series I liked well, and when good reviews started popping up Goodreads as the release date neared, I couldn’t wait to get my hands on the book. Spoiler warning for Unearthly and Hallowed! Many things have happened since the end of Hallowed, including the things that happened in Radiant. Now Clara is a college student in Stanford, with no clear direction except that she wanted to protect Tucker from the dangers of her angel life, even if it means breaking both their hearts. Clara tries to make a home in Stanford, but it’s not so easy: she finds Samjeeza, the Black Wing, following her everywhere, her visions are still bleak and scary, and her dad has come to prepare her and Christian for an upcoming battle. Christian remains to be the perfect gentleman that he is and one of her closest friends, but Clara can’t help but think of Tucker even if she knew she made the right decision. With all this happening in her life, is Clara ready to face the the things she’s been seeing in her vision? And why is Angela acting so weird again? 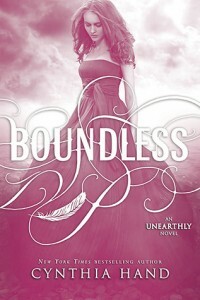 So, Boundless. I went in this book, ready to get my heart broken for some reason, and for tears to come. Interestingly enough, I didn’t get much of those two expectations, but there were so many things in this book that I had a hard time putting it down. I liked how the story revolved a lot around Clara’s growth in Stanford — her classes, her friendship with Angela and Christian and the new people she meets in college — and not just the angel stuff. We see Clara (and Angela and Christian) grow more in this book, face their choices and follow through. I liked that they don’t always have to face their choices alone, and how they all managed to pull through for each other up to the very end. There’s also so much family in this book, both in the good and bad side, and I liked how they were weaved together (even if some of them felt a little bit too convenient in the end). I liked how they never let go of that concept and how it all tied them together.